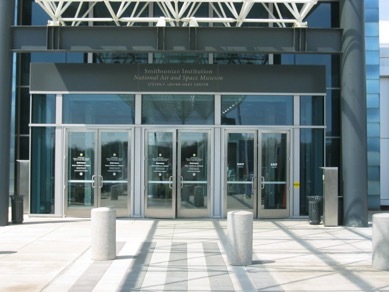 A partner facility to the National Air and Space Museum on the National Mall in Washington D.C, the Steven Udvar-Hazy Center is home to major Smithsonian artifacts too large for the original museum. 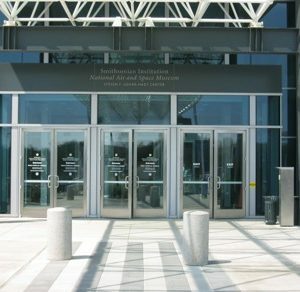 It is located at Dulles Airport and comprises two hangars – the first featuring large rockets, satellites, and aircraft including a Concorde, and the Space Shuttle Discovery. 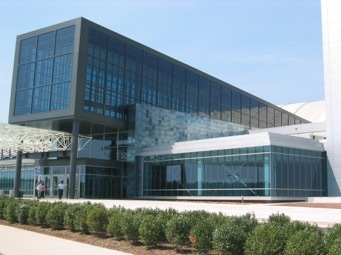 This hangar is 10 stories high and covers the area of approximately three football fields. The second hangar is for restoration and preservation of items in the collection, and there is enough space for more than one aircraft at a time; these aircraft can then be repaired simultaneously. 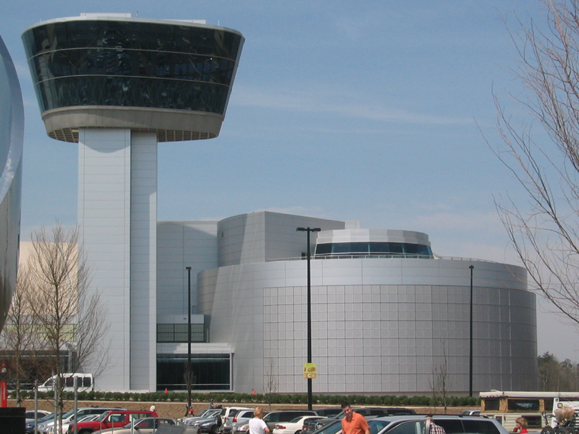 The Steven Udvar-Hazy Center also includes the Airbus IMAX® Theater, and the Donald D. Engen Observation Tower, which provides 360-degree views of Dulles airport and the nearby area. 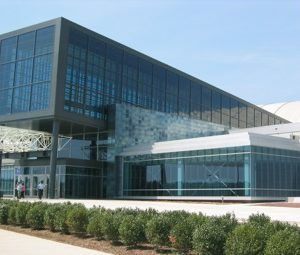 It houses exhibits which highlight air traffic control responsibilities and operations, and information about airports. 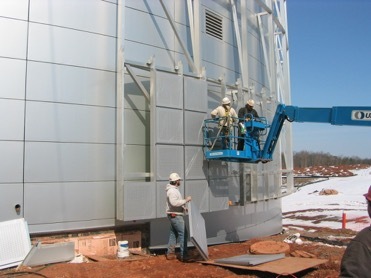 The building spans 708,000 square feet and Metalwërks products were used across 50,000 square feet of the façade. 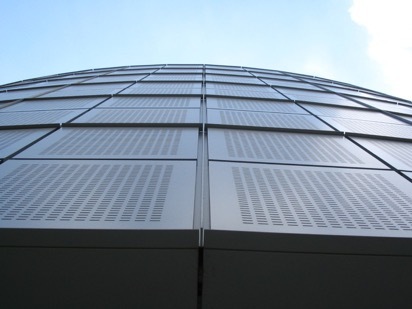 Metalwërks Omniplate™ 1500 Closures were used at the entrance pavilion, building perimeters, and formed fascia, soffits, and curtain wall enclosures. 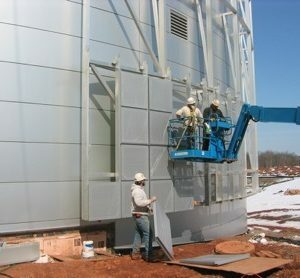 These panels were manufactured with wet-sealed aluminum and shaped to surrounding perimeter conditions and curtainwall assemblies. 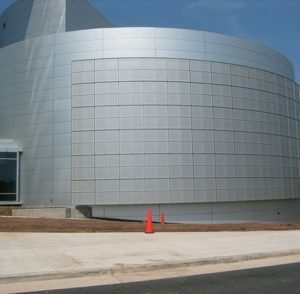 The round IMAX Theater structure included a custom aluminum screen wall assembly, developed by Metalwërks, with unitized, slot-perforated panels. 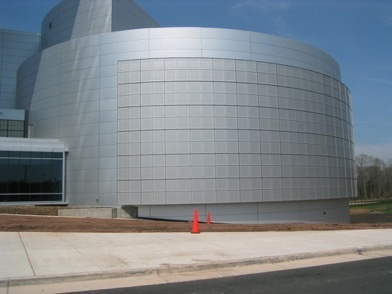 These featured extruded reveals and an engineered aluminum support system. 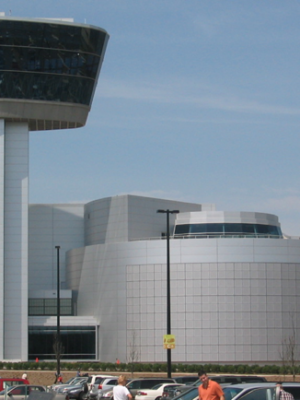 Metalwërks were able to provide product that precisely matched the design intent, which called for a major “T”-shaped reveal at a 6’ x 6’ open grid, and closed minor reveals which are filled with the matching color material in the background of the reveal joint. 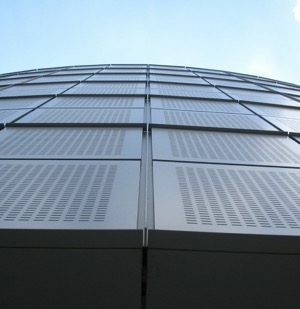 The panels also had a slot perforated pattern with solid margins.